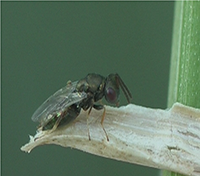 The Pteromalidae are a very large family of parasitic wasps. 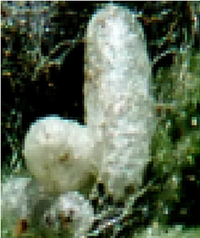 The majority are (as with most chalcidoids) parasitoids of other insects. They are found throughout the world in virtually all habitats. In essence, a "pteromalid" is any member of the Chalcidoidea that has five-segmented tarsi and does not have the defining features of any of the remaining families with five-segmented tarsi. Unquestionably, this family will be divided into several families in the near future.